The generation-skipping tax (GST), also sometimes called the generation-skipping transfer tax, can be incurred when grandparents directly transfer money or property to their grandchildren without first leaving it to their parents. The GST doesn't just apply to grandchildren. It also addresses gifts or transfers made to other family members and to unrelated individuals who are at least 37 1/2 years younger than the donor. All such beneficiaries are referred to as "skip persons." The parent's generation is skipped to avoid an inheritance being subject to estate taxes twice—once when it moves from the grandparents to their children, then from those children to their children. The Internal Revenue Code (IRC) has therefore applied an additional tax to these inheritances since 1976—the GST—to compensate for the estate taxes that might otherwise have been avoided. The GST can be levied on both direct transfers to these beneficiaries and gifts made to them through trusts. Trusts are also considered to be skip persons under some circumstances: All the beneficiaries of the trust are skip persons to the donor or no dispositions of income or property are to be made to anyone who is not a skip person. These individuals must have a "beneficial interest" in the trust. This means she has a present and immediate right to the trust's principal and interest earned. IRC Section 2651(e) makes an exception for grandchildren whose parents have predeceased them. In this case, the children effectively move up into their parents' place in line so the GST no longer applies to them—the gift isn't skipping a generation. An exemption is an amount that can be directly transferred to grandchildren or into a generation-skipping trust for the benefit of grandchildren without incurring a federal GST. The GST shares the same lifetime exemption as the federal estate and gift taxes, and that exemption is pretty significant as of 2018. Under the provisions of the Tax Relief Unemployment Insurance Reauthorization and Job Creation Act of 2010, the federal GST was repealed for that year. It came back in 2011, however. The exemption was $5 million at that time. Any gifts made over this amount were subject to a 35 percent tax rate. The federal GST exemption increased to $5.12 million in 2012, and the tax rate remained steady. Then came the American Taxpayer Relief Act (ATRA) in 2013. Under the terms of ATRA, the GST tax exemption increased to $5.25 million but the GST tax rate jumped to 40 percent. ATRA also indexed the exemption for inflation, so it has subsequently increased from year to year. The 2014 generation-skipping transfer tax exemption went up to $5.34 million, and as of 2017, it was set at $5.45 million. When the Tax Cuts and Jobs Act (TCJA) went into effect in 2018, this legislation more or less doubled the exemption to $11.18 million. This allows grandparents to give away a lot of money and property, but it might not be permanent. The TCJA and most of its terms are set to expire at the end of 2025 unless Congress takes steps to renew it. The GST tax rate remains at 40 percent. Married couples can double these exemption amounts, resulting in a significant cash and property that can be transferred without taxation. The average taxpayer will most likely never have to worry about these rules. Those for whom they're a concern should speak to an estate planning attorney for guidance as to how to set up their estates for maximum protection. The IRC also provides for an annual exclusion, just as it does for gift taxes. You can give away up to $15,000 per person per year as of 2018 without incurring the GST. Married couples can double this amount because they're each entitled to give $15,000. Gifts made to skip persons either outright or through a trust are referred to as "direct" skips. Paying any GST that comes due at the time rather than applying any part of the lifetime exemption turns the direct skip into an "indirect" skip. The tax must typically be paid in the year the gift is made. 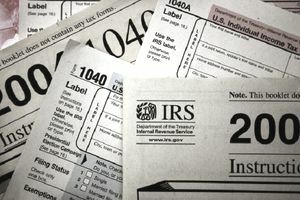 All direct skips in excess of the $15,000 annual exclusion are to be reported on IRS Form 709, the U.S. Gift (and Generation-Skipping Transfer) Tax Return. They're entered in Part II of Schedule A. If you enter them on Schedule C of Form 709 as well, they're direct skips and they're tallied up over the years to be applied against the $11.18 million lifetime exemption. Part III of Schedule A records indirect skips. Your direct skips are subtracted from the lifetime exemption each year you do this, ultimately leaving less of the exemption to protect your estate from estate taxes at the time of your death. Many states that collect state estate taxes also collect state generation-skipping transfer taxes. Check with your state taxing authority, your accountant, or your estate planning attorney to learn the rules in your location. NOTE: State and local laws change frequently, and this information may not reflect the most recent changes. Please consult with an accountant or an attorney for current tax or legal advice. The information contained in this article is not tax or legal advice and is not a substitute for tax or legal advice.